Bless Mama Afrika - Miriam Makeba, and bring peace to her family and loved ones. A Luta Continua Mama Afrika ! South African singing legend Miriam Makeba has died aged 76, after being taken ill in Italy. She had just taken part in a concert near the southern town of Caserta, the Ansa news agency reported. The concert was on behalf of Roberto Saviano, the author of an expose of the Camorra mafia whose life has subsequently been threatened. 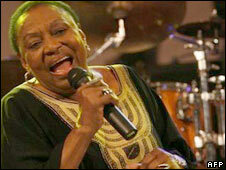 Ms Makeba appeared on Paul Simon’s Graceland tour in 1987 and in 1992 had a leading role in the film Sarafina! Ansa said she died of a heart attack. Oh Mother Afrika! We miss you still....now...always...sing to us....soothe us with your song...sing still to us! leave us...not yet...not yet.. always hope in your song....always sing to us....leave us not. Thank you all for these vids! Mama Afrika was sooo beautiful! Nkosi Sikilele Afrika, that IS our anthem. THAT is the international anthem of African people. We need to learn it and teach our children. Peace. JOHANNESBURG (AFP) — Miriam Makeba, the musical symbol of black South Africans' struggle against apartheid, has died at the age of 76 after collapsing at a concert in Italy. Nelson Mandela led tributes Monday to the singer who had international hits with songs such as "Pata Pata" and "The Click Song" while she was banned from entering her homeland. "She was South Africa's first lady of song and so richly deserved the title of 'Mama Africa' . She was a mother to our struggle and to the young nation of ours," Mandela said. Ever the activist, Makeba collapsed after singing in support of an Italian author facing Mafia death threats. She was treated while the audience shouted for an encore but died in hospital from a heart attack, officials said. Makeba "died performing what she did best -- an ability to communicate a positive message through the art of singing," said South African Foreign Minister Nkosazana Dlamini Zuma. He called her "one of the greatest songstresses of our time." Born in Johannesburg on March 4, 1932, Makeba became one of Africa's best known singers and while Mandela was in prison took up the battle against apartheid through her music. South Africa revoked her citizenship in 1960 and refused to let her return for her mother's funeral. 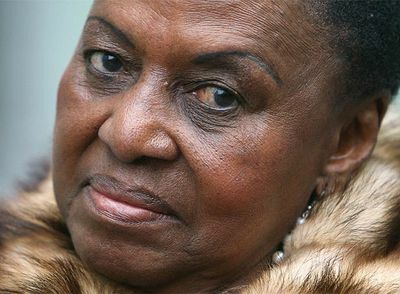 Makeba spent more than three decades in exile, living in the United States, Guinea and Europe. Her music was outlawed in her homeland after she appeared in an anti-apartheid film. But she was an international success, winning a Grammy award for Best Folk Recording with US singer Harry Belafonte in 1965 for the album "An Evening With Belafonte/Makeba". "I kept my culture. I kept the music of my roots," she said in her biography. "Through my music I became this voice and image of Africa, and the people, without even realising." But she also met controversy abroad. The third of her five marriages -- to civil rights activist and Black Panthers leader Stokely Carmichael in 1968 -- provoked anger in the United States and some of her concerts and contracts were cancelled. She was also briefly married to trumpeter Hugh Masekela, another famous South African artist who spent long years in exile under apartheid. Makeba was the daughter of a Swazi mother and Xhosa father. She started singing professionally in the early 1950s with a group called The Manhattan Brothers, with whom she toured the United States in 1959. Her career at home took off in the same year when she appeared in a musical version of the film "King Kong". She also made a brief appearance in an early anti-apartheid film "Come Back, Africa" which earned an invitation to pick up an award at the Venice film festival. Once there however, it became clear that her life would be in danger if she went home, where harsh apartheid laws had been enacted in 1958. South African authorities revoked her citizenship. Makeba had her biggest hit in 1967 with "Pata Pata" -- Xhosa for "Touch Touch", describing a township dance -- but unwittingly had signed away all royalties on the song. She was often short of money and could not afford to buy a coffin when her only daughter, Bondi, died aged 36 in 1985. She buried her alone, barring a handful of journalists from covering the funeral. According to her biography, she also battled cervical cancer and a string of unhappy relationships. She denied rumours of alcoholism. While she was still in enforced exile, she performed with Paul Simon in the US singer's 1987 "Graceland" concert in Zimbabwe, neighbouring South Africa. She finally returned to her homeland in the 1990s after Mandela was released from prison and the apartheid system began to collapse. It took six years to find someone in South Africa to produce a record with her. She entitled it "Homeland". Sunday's benefit concert was at Castel Volturno, near southern Naples, to support Roberto Saviano, author of the best-selling mafia expose "Gomorrah." Makeba was the last on stage, performing for the 1,000 crowd for half an hour before collapsing, according to Carlo Hermann, an AFP photographer at the concert in the town which is considered a stronghold of the Camorra mafia. "There were calls for an encore and at that moment someone asked if there was a doctor in the house. Miriam Makeba had fainted and was lying on the floor." Mama Afrika Miriam Makeba was a giant, and it saddens me to hear of her passing. We will all miss you, Mama Afrika! May you reside with the gods, and win them to our cause with your beautiful voice! IZWE LETHU I AFRIKA! AMANDLA! AWETU! Its sad to hear of the passing of Mama Afrika, we will surely miss her, but her contribution to the struggle against aparthied will never be forgotten. Long live the struggle against aparthied, power to the people. Power to Mama Afrika as she takes her place amids the ancestors. MAY ALLAH HAVE MERCY ON HER BEAUTIFUL SOUL!